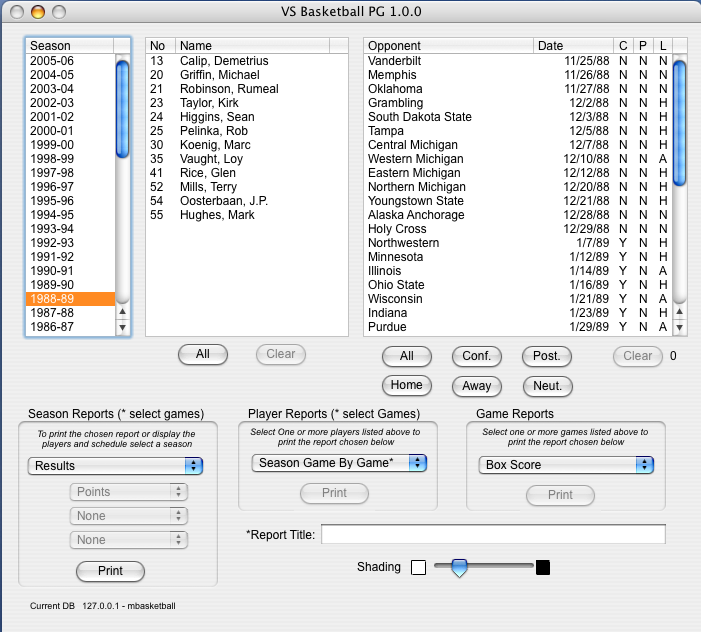 VS Basketball PG (Pre/Post Game) is a database driven application desig ned to manage your current and previous seasons Basketball statistics. It can generate team and individual reports for a game, season or career along with records for each statistical category. Additionally, the data can be optionally integrated into your web site so that staff, fans and the media can browse through your game's, player’s and team’s history. Import games in seconds with commonly used 'BPK' or XML files or enter them manually. Single database for all seasons allows for career, team and individual records along with numerous reports versus a given opponent. Data can be deployed and accessed from a local file, file server or web server. Optionally maintain the entire statistical history of your team from the first game ever played to the most recent, all in one system. Available for Mac or Windows. A complete demo of the product along with user manual is available. Just e-mail us at info@VarsitySystems.com and specify "PG" along with your preference for Macintosh or Windows.